Leading up to the inauguration of Laurie L. Patton as the seventeenth president on Sunday, October 11, 2015, Special Collections & Archives will feature remarkable women from the College’s history in eight temporary exhibits spread across campus. Mary Annette Anderson can be found in Axinn and Bicentennial Hall, now through October 5th. 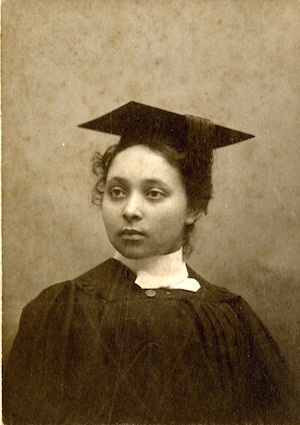 Mary Annette Anderson was the first woman of color to graduate from Middlebury College and the first woman of color to be inducted into Phi Beta Kappa honor society. She was born in Shoreham, Vermont to William Anderson, a former slave who traveled north after the Civil War and purchased his own farm, and Philomine Langlois of French Canadian and Indian heritage. Additionally, she was the first woman to address the distinguished guests—the College president, trustees, alumni, and professors—at the “Corporation dinner,” and her graduating class sang a poem she penned at their Class Day celebration. After graduation, she moved to New Orleans, Louisiana where she taught at Straight University for one year before joining the Howard University faculty in Washington, D.C. She taught English and Rhetoric there until 1907 when she married fellow faculty member, Walter Lucius Smith. Eventually she returned to Vermont with her husband, who completed postgraduate work at the University of Vermont. She died in 1922 at age forty-seven.